December | 2011 | Killed in a Smiling Accident. Probably not what you were searching for. From all here at KiaSA –Zoso, Melmoth, the Captcha AI, and the train of angry mobstacles that chased us back to the blog one day– we’d like to wish a Merry Christmas to all, and to all some fat loots. May your PuGs be merry and bright, and may all your instance runs delight. This entry was posted in mmomas and tagged mmomas on December 25, 2011 by Melmoth. This entry was posted in happy steam sale season, melmoth, zoso on December 23, 2011 by Zoso. An opening crawl for a crawling opening. This entry was posted in melmoth, mmo, swtor and tagged melmoth, mmo, swtor on December 22, 2011 by Melmoth. It’s the little things which are making me smile with respect to Star Wars: The Old Republic at the moment. For example: right click your companion’s portrait and you can instruct them to sell all the trash loot from your inventory, similar to the peddling pets feature in Torchlight which impressed me back in the day. In SWTOR the companion dashes off for sixty seconds (a timer appears on their portrait) and then returns to you, wherever you may be, and hands you your profit. It’s one of those simple ‘quality of life’ mechanics which avoids the player having to spend time and effort doing maintenance on their inventory, something which I very much appreciate having come to SWTOR from Skyrim: Thanes of Inventory Juggling; certainly if there isn’t already a mod in Skyrim to do something similar, I can’t imagine it will be too long in coming. 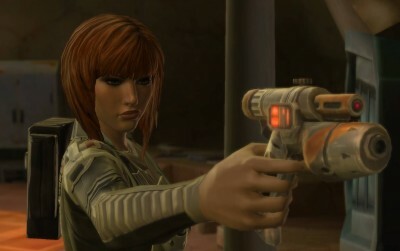 This entry was posted in melmoth, mmo, swtor on December 22, 2011 by Melmoth. Bounty Hunters do it with Nerf guns, apparently. NOTE: Not Bunty Hunter, as I’m wont to typo; much as it amuses me to think of ruthless hardened mercenaries flying around the galaxy looking for errant editions of the British comics anthology for girls. This entry was posted in melmoth, mmo, swtor and tagged melmoth, mmo, swtor on December 21, 2011 by Melmoth. Playing solo is highly reminiscent of a single player Bioware RPG, odd MMOG-ism aside (a marketplace of infinitely respawning bandits here, an orderly queue to click on a quest item there), no bad thing, and in a group the conversation system (everyone picks a reply, there’s a roll to determine which is actually used) has worked rather well so far. With a single voice (per gender) for each class one slightly jarring thing in a party was someone else speaking with ‘my’ voice, which did make me realise how much I was identifying with my character. With many servers already groaning under the strain of pre-order players it’ll be interesting to see if today’s official launch brings them crashing down like a lassoed AT-AT, but queues aside the pre-launch period has been pretty smooth. “The future’s uncertain and the end is always near”, as Oscar Wilde said when he was fronting The Doors, but for now it’s not a bad start. This entry was posted in swtor, zoso on December 20, 2011 by Zoso. It’s an exciting old time for prospective Star Wars: The Old Republic players as Bioware reintroduce some Christmas magic, the anticipation of opening advent calendar doors and counting up to the big day. Most advent calendars are a bit dull and predictable (apart from the ones with cool stuff in them), though, so for extra fun Bioware are introducing a random element into when players get their early access, based on when they pre-ordered the game. It’s an eminently logical system to smooth out massive spikes of demand on game servers, customer support and associated infrastructure, but has naturally resulted in some mild disappointment from those who have yet to get it. That’s “mild disappointment” in the Internet sense, of course, centred primarily around the official forums, but Web 2.0 and distinctly anti-social media allow the keen spectator to experience new and interesting spellings of “ridiculous” across news site comment threads, Facebook, Twitter and the like. eBay Allow one user into headstart every five seconds, allocate each five second window an individual code, then put the codes up for sale on eBay. What could possibly be fairer than a money-based system in these times when I think we’re all agreed financial inequality is a thing of the past? The Postal Service Just pop all the invites in the post, and thanks to the vagaries of the postal service they’re bound to arrive at random times (or be delivered to random addresses that might look a bit like the right address, if you squint. A lot.) Deluxe or Collector’s edition codes could be posted in envelopes, the rest in larger package that have to be collected from the post office, a bonus if release is timed to coincide with pension day in the UK. Safari Park Treasure Hunt Adventure In conjunction with safari parks around the world, conceal invitations in animal enclosures. Invites to PvE servers would be scattered around with okapi, tapirs, armadillos, binturong etc. Invites to RP servers would be in with the primates, giving a (sort of) authentic Wookie/Ewok vibe. Invites to free-for-all PvP servers would be scorched into hunks of meat and thrown in with lions and tigers. Black Friday With a bit more thought given to the timing, Bioware could’ve had early access invites in boxes in Walmart to add to the happy fun shopping time. Panto Season Another topical option (oh no it isn’t) (oh yes it is) (etc) offering several methods for invitation distribution such as whether a glass slipper is a perfect fit for the prospective player, making the magic invite available in exchange for a cow, and putting the invites in a bowl of porridge that’s just the right temperature. This entry was posted in melmoth, swtor, zoso on December 15, 2011 by Zoso. Every true, eternal problem is an equally true, eternal fault; every answer an atonement, every realisation an improvement. It’s quite astonishing how my attitude to a game can alter through the simple expedience of changing how I approach it. That is, how I approach playing it, not how I approach the game itself, lest any of you were having visions of this author walking stiffly, military fashion, towards the computer from the front; then another time sneaking, hunched-over and on tip toes, before slithering into my computer seat from underneath the desk; another time bombing from atop the arm of the sofa while screaming ‘banzai!’; yet another time slowly crawling, sloth-like, with ponderous arms and improbably dextrous legs, from around the back of the monitor. Heading into Lord of the Rings Online for the recent Update 5 found me completing about forty minutes of, to my mind, uninspiring epic book content. Even Tolkien’s epic tale had its slow patches, and I suppose I should be thankful that at least there was no sign of melancholy poetry or inapposite singing in the LotRO content. I don’t know, maybe the singing in Tolkien’s work was justified, but I always used to skip over reading it because it always seemed awkward to me, the middle-earthian equivalent of the silent mournful contemplation at a funeral being broken up by one attendee gently tapping their foot and then crooning “Oh baby, baby, how was I suppose’ t’know”. Feel free to add head jiving and hand claps to your own taste. I’m not sure whether it’s the case that I’m simply tired of the game, or if this latest update –and, indeed, entire expansion– has actually been as lacklustre as I believe. I find myself beginning to wonder whether Turbine are starting to focus a little too much on in-game store items, or if this expansion is a stop-gap while they work on a more impressive Moria-like expansion for Rohan, or indeed if they’re working on another game entirely and have perhaps stretched their development teams too thinly. It certainly doesn’t help that the Warden class, which has been a favourite of mine for some time, has been tweaked and tampered with, presumably to the satisfaction and appeasement of raiders and spreadsheet optimisers, but unfortunately to the detriment of the soul of the class. Such a simple and elegant mechanic has now been twisted and tortured, with new parts bolted on, such that it has become a warped image of its former beauty, it is the Hollywood star unable to accept their aging gracefully, undergoing plastic surgery after plastic surgery until they no longer resemble their former selves, instead appearing more like some poor cousin of Gollum, one who has stood for too long in a wind tunnel while orange paint and superglue were fired with great force at their face. I had dipped my toe back into the frosty unappealing waters of LotRO because I found the fire of my enthusiasm for Skyrim starting to flicker and diminish. Where before had been a roaring inferno of gaming passion, a veritable burning city of desire, there now stood a small camp fire: warm, safe, comforting, but without the flare, fervour or fascination of that former passion. The game had not changed, and I estimated that I had discovered but half of what its vast and ranging lands had to offer, so why had my view of the game changed so? I contemplated that perhaps I had changed the position from which I viewed the game. I took a step back and looked at how I was playing the game now, comparing it to how I had approached it when I first started out, back when it was fresh and I was unaware of how the world operated. It soon became obvious that I had, in the finest MMO tradition, begun to optimise the way I played the game. Instead of heading out from town and adventuring in the world, I had become a slave to the Quest Shopping List. When I wanted to adventure, I realised, I now immediately opened my quest log and looked at which items I could tick off, preferably those which were the quickest. Then… THEN (for shame) I would open the map and fast travel to the nearest location to my destination, so as to cut out any of that messy running around business. It was I who had devolved the wondrous emergent discovery-based game-play of the world of Skyrim into a simple MMO quest pipeline; I was a cog in die MMO Schleifen-Maschine once again, crushing content with maximum ruthless efficiency. All of a sudden, just like that, the game had become utterly bland, it was the bleak whiteout monotony of Skyrim’s storm-thrashed barren ice flats realised in game-play form. Thus, last night, after achieving this minor epiphany, I logged-in to the game. I checked my equipment was in good order, headed out of the main gate of the city, picked a direction, and began to walk. Six hours later I tore myself away, but only so that I could give this weak human shell the sleep it deems necessary to function. I still haven’t finished the main quest line, or many of the quests sitting in my journal, and now once again, I’m very pleased to say, I don’t care to. This entry was posted in lotro, melmoth, mmo, skyrim and tagged lotro, melmoth, mmo, skyrim on December 15, 2011 by Melmoth. One’s action ought to come out of an achieved stillness: not to be mere rushing on. Christmas is almost upon us once again, and as this luminescent blue-white pearl which we call Earth continues its ageless pirouette against that infinite star-glittered backdrop of black satin, people across its circumference take time out of the hectic schedule of existence to celebrate the birth of the Lord Jesus Christ; which, in this modern age, seems to consist of taking a list of the Seven Deadly Sins and seeing how many one can tick off in a single day. An MMO launch should fit right in. Star Wars: The Old Republic has begun its early access event. You may even have chanced upon this news already from some obscure remote corner of your social network, perhaps old Mrs Crumblejowls down at the corner shop, or in the pained synchronised barking of every dog around your neighbourhood. If you hadn’t heard about the launch of SWTOR, then you may want to consider the case that you are, in fact, deceased – confirm this by checking for your pulse, or seeing whether you can walk through doors without having to open them, that sort of thing. If you are indeed no longer of this mortal coil, you may need to recruit the aid of a small boy who can see dead people to sort out your terrible predicament, although be warned: he may actually be too young to successfully complete the registration of your SWTOR subscription. Many have wondered at the timing of BioWare’s release of SWTOR so close to Christmas, but we must consider that for many this is also a time of remembrance of Lord Jesus Christ. Or Darth Christ as he is in the Old Testament. Strong in the ways of the Force: able to Force heal, move impossibly large objects with his will –such as the stone doors to tombs–, and return as a Force Ghost upon his death, he was a powerful Sith Sorcerer. He was also prone to acts of rage, such as destroying temples (Anakin Skywalker’s later tribute being considered tasteless and excessive). Lord Christ was also unusual in taking on many apprentices at once –up to twelve at one point– rather than the single Master-Apprentice relationship which is more common among the Sith Lords. Opinion is divided as to why he did this, but the most common assessment is that it was perhaps a show of strength on his part, demonstrating his complete belief in his mastery of the Force. Alas, as is always the way with the Sith, one of his apprentices betrayed him in the end. Of course in many of the depictions of him, Lord Christ is seen to be wearing a beard style more common to the Jedi than the Sith. Not only this, but he enacted numerous good deeds during his time, leading many scholars to question his true nature, and whether he may have in fact been a Jedi double agent. Back to the seven sins. I think Gluttony is a fairly easy score, and thus isn’t a terribly high value on the Sin-o-Meter. Much like Christmas, the MMO family sits itself around the feast of new content and gorges itself to the point of bursting. And as with Boxing Day, there comes a point where the overindulgence strikes back, with players unable to hear mention of the recently released MMO without grabbing their mouth with both hands, cheeks bulging, and making a dash for the nearest bathroom. Wrath is also in evidence, as people find themselves excluded from the early access, be it due to a lack of invitation, failing Internet service, or the inconsideration of Real Life, getting in the way as it does, like the cat underfoot that wants feeding as you’re trying to juggle pans of boiling water and molten fat as you serve the Christmas dinner. Envy goes hand in hand, with outsiders watching with green eyes those people who have spent months preparing themselves, and now put their entire life on hold for a day or more, so that they can play the game seventeen picoseconds after the servers have opened. It’s common knowledge in the MMO community, of course, that the experience is so much better when consumed fresh, and that most MMO servers go stale quickly a day or two after launch, whereupon the whole thing becomes pointless. Anyone coming late to the party will have to pick through the messy bubble and squeak of content which is left over. Of course it’s all about community at the start, being there at the beginning, sharing the experience; very much like the crowd at the January Sales is all about community, understanding and sharing with your fellow man. I also imagine Lust is well covered in certain quarters, and that there are some keyboards out there that could really do with a quick run through a dishwasher to loosen the keys again, but thus far we’ve thankfully been spared the twitpic evidence of this. Regardless of my cynical musings on the launch of a new MMO, congratulations must be made to BioWare for one of the smoothest launches I think I’ve ever experienced. It may have been a regimented and cordoned and corralled crush, like the queue to see Santa in a major shopping centre, but in combination with an incredibly strong server system, it seems to have worked like a charm. I can still remember fully half of World of Warcraft’s subscribers being unable to play the game for a day or two after launch because they couldn’t register their credit card details on Blizzard’s failing website; I should know – I was one of them. BioWare have learned from and improved upon that debacle by several orders of magnitude, and so I’m left wondering what it will do for MMOs if the actual game can do the same with respect to the current market leader’s efforts. This entry was posted in bioware, melmoth, mmo, swtor and tagged bioware, melmoth, mmo, swtor on December 14, 2011 by Melmoth. It seems that someone at Activision read the same piece, as we’ve just fabricated a document that details how Call of Duty 19: Modern Warfare 7 will feature selectable story difficulty, and what effect that will have on the opening scene. SCENE I. The player is alone in a plain white room with no doors, window or furniture. From nowhere, SERGEANT STAN “ICEBALLS” JOHNSON appears. He removes his left shoe and places it on his head. DIRECTOR (OFFSTAGE): No, no, no! A hat, most certainly, not at all! JOHNSON removes the shoe from his head and hurls it to one side. JOHNSON: Nothing to be done, nothing to be done. SCENE II. A ROADSIDE, with two TREES and a STATUE. MAJOR ARTHUR “SPERPLE” MANN stands behind the statue. MANN: The buzzing, the notion of buzzing, the notion. (Pause) The notion. (Pause) The buzzing. (Pause) I cannot possibly and yet! ENTER SERGEANT STAN “ICEBALLS” JOHNSON, STAGE LEFT. He wears no right shoe, only the left. MANN: Well here’s a fine thing. JOHNSON: (Violently) What is beyond? MANN: Infinite, but why not a cupboard? (Pause) Perhaps it is still green. (Wearily) And what of the terrorist cell tracked down to South Khorasan? JOHNSON: (Mumbles) And you’ll give me a sugar-plum? MANN: (Screams) A sugar-plum? A sugar-plum? A sugar-plum? The very devil! SCENE III. BARE INTERIOR. ENTER JOHNSON, STAGE RIGHT. He turns to the player. He turns away from the player. EXIT JOHNSON, STAGE RIGHT. ENTER JOHNSON, STAGE LEFT. He turns away from the player. ENTER MANN, STAGE LEFT. He turns to the player. JOHNSON’S TROUSERS fall down. MANN POINTS to something unseen in the distance. This entry was posted in waiting for godmode, zoso and tagged waiting for godmode, zoso on December 12, 2011 by Zoso.